Intel is reportedly looking to outsource some of its 14nm CPUs and chipsets to rival semiconductor fab TSMC. The company’s 14nm supply was already looking a little less than rosy, but off the back of even more supply shortfall news, it looks like Intel has been given little choice but to buckle up and buy some capacity at a rival foundry. Intel’s 14nm process has been around since the 6th Gen Skylake processors, which you’d expect would lead to a mature process with high yields. However, the delays in the 10nm process besetting Intel – the new node is currently delayed until ‘holiday 2019’ – has caused further repercussions for the company. Most especially it has affected its prolific 14nm process, used in almost every single product within its product stack. TSMC is the foundry currently responsible for Nvidia’s graphics card lineup, including the recently announced RTX 2080, and, since GlobalFoundries has announced it is now backing down from 7nm die shrinks, the Taiwanese semiconductor behemoth will soon manage all of AMD’s graphics and CPU products, too. Soon, it looks like TSMC might be adding Intel’s core processors to its star-studded client list. Intel’s server-grade Xeon parts and the majority of its chipsets will stay with the company, report industry sources close to DigiTimes, however, the budget H310 chipset, which was the first part to be placed on hold due to Intel’s manufacturing constraints, along with some 8000-series CPUs, will be sent off to TSMC. That likely doesn’t mean Intel’s i9 9900K, which, judging by recent benchmarks, will be launching pretty soon, but the early 8th Gen chips are on the agenda as some of the first to go if the reported move goes through. If Intel has to make up a large supply deficit in a tight spot, it could be offloading quite a bit of its 8000-series products to TSMC. In turn, this could result in some variance in performance based upon where each processor was manufactured. The sources indicate that Intel’s 14nm production may be falling 50% behind demand for the company’s parts and this sizeable deficit is affecting some of Intel’s top clients. SemiAccurate recently got hold of some rather damning internal documents from HP Enterprise, one of the major players in the global server market. The documents state that, in lieu of Intel’s Xeon parts, the company is now instead recommended AMD’s EPYC processors to its top clients who are in need of rapid roll out. 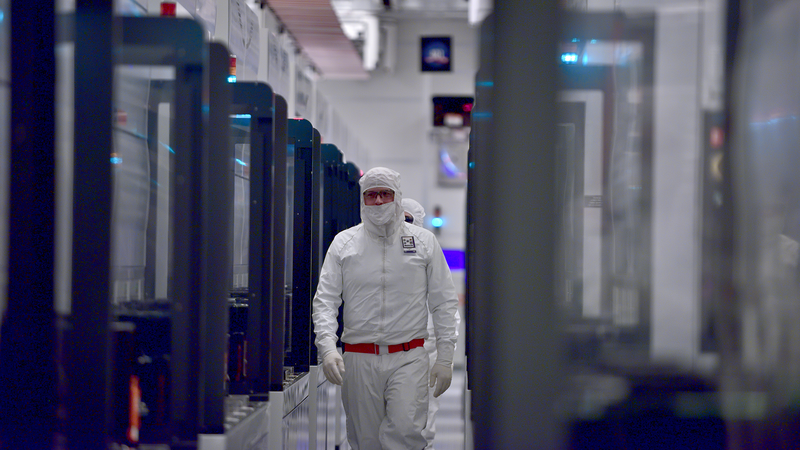 Intel’s not expected to correct its own manufacturing shortfall until the end of the year. AMD must be counting its lucky stars at this point. Not only has the company put together a server-grade part capable of competing with Intel’s Xeons chips in core count and price/performance, it now has its prime rival crumbling under the pressure born out of one severely delayed process node. But, in recent light of GlobalFoundries’ announcement especially, process node density is starting to show signs of a serious slowdown. It’s just not as profitable as it once was to make things smaller and smaller, and Intel, with its rather unique position as both semiconductor designer and manufacturer, may have just been more susceptible to the Moore’s Law bug that will inevitably creep up on everyone else in the industry in time. intel has so far declined to comment on the report of a move to outsourcing some of its chip manufacturing to TSMC.